The idea of saving grease — namely, animal fat that has been rendered from meats in a frying pan — dates back centuries. For many cultures, it was an economical way to use and reuse every bit of an animal, especially in a time before refrigeration. At the time of the Great Depression, animal fat was the preferred method for frying. Lard, bacon grease, ground beef renderings, chicken fat and more were poured from cast iron pans into aluminum or steel cans designed for the purpose. You’ll find some of these simple, lidded cans in online auctions. The grease could then be reused directly from the canister to add flavor to simple meals and save budgets for cash-strapped families. When food rationing arrived during WWII, the process continued to be a necessity and the tradition lived on. By the time the parents of boomers established their own homes in the late 40s and 50s, it was natural for them to follow the ways their mothers had followed before them. In Mister Boomer’s household, the grease can was most often a coffee can, usually a red Hills Bros. can. The Hills Bros. company had developed a method for vaccuum-packing coffee in 1900. Starting out in California, they pushed west into Chicago and the Midwest in 1920, so Mister B’s grandparents were probably familiar with the brand before his parents. He does not know, however, if his grandparents used the coffee can as a grease can. Excess drippings — especially from bacon — were poured while still hot and liquid into the can, which was kept on the stove. As the grease cooled, it congealed into a shortening-like consistency, with a slightly yellowish-brown tinge. Mister B’s mother would scoop a teaspoon or two of the gunk into her cast iron pan before frying eggs on Sunday morning. Since the grease had not been strained, blackened burnt bits that had been suspended in the congealed stuff now ended up on the white areas of the frying eggs. Mister B is convinced that to this day, this visual, and knowing the process that created it, is what has contributed to his not liking fried eggs. The horror! The horror! The grease can also had another practical side. After about a week, or when the can was sufficiently full, the entire can, with its congealed contents, could be tossed into the garbage. Very early on, people knew that grease and kitchen pipes were not a happy mix. It would be best not to pour the stuff down the drain. The repurposed grease can provided an easy, no-mess method of disposal. First, a used piece of aluminum foil could be stretched over the top. When the coffee companies started providing plastic lids to cap the can once it was opened, the lid could serve this purpose on the final journey of the grease can as well. Somewhere around the mid-60s, the grease can disappeared from Mister Boomer’s family kitchen. He can only surmise that its demise coincided with two events in his home: his mother had returned to the work force part-time, and for the first time, paper towels were purchased and used in his kitchen. It’s entirely possible that it was a culture thing as well. After all, reusing grease had been a sign of austerity, and in the modern 50s and 60s, a housewife wanted to be thought of as contemporary and suburban. So which is it for you, boomers? Does the grease can evoke nostalgic memories of flavor-added foods, or a horror that is best left in the past? On a recent picnic outing with friends in a local park, Missus Boomer saw a small toy nestled in the grass. She picked it up and gave it to Mister B. It was a plastic long snouted dinosaur. Some poor child undoubtedly lost track of it, and now here it was, immediately transporting Mister B back to his own childhood years. Unlike genuine, highly collectible plastic dinosaurs from our boomer years, this one did not have the name of the dinosaur stamped into its tail. Instead was the stamp of modern toys: "Made in China." Plastic injection-molded toys became possible after polystyrene was invented in 1927. One of the first mass-market toys to take advantage of this new, durable material was Lego, introduced in 1932. After the War, the stage was set for toy manufacturers to supply a baby boomer generation with all types of toys. While Tonka relied on child-resistant metal, and Lincoln Logs continued to be made from good old-fashioned wood, plastic toys were the future, as stated in The Graduate (1968) when a friend of the father of Dustin Hoffman’s character pulls him aside to give him that famous one word of advice. When it comes to the ubiquitous toys manufactured after World War II, there probably aren’t too many as popular — especially among young boys — as plastic dinosaurs. Like today, boomer boys would study and memorize the names of the dinosaurs, only to take their plastic toys and stage mock battles. Mister Boomer had a small set of dinosaurs, consisting of a flying Pterodactyl, dorsal-plated Stegosaurus, super-sized Brontosaurus, vicious Tyrannosaurus Rex, three-horned Triceratops, armored Ankylosaurus, plant-eating Trachedon and the sail-finned Dimetrodon. In Mister B’s dino vs. dino battles, the T-Rex never won. They were dull brown, gray and green colors, not the brighter reds, yellows and greens of later-year 1960s plastic dinos, and of course, there was no such thing as a dinosaur whose tail didn’t drag on the ground. Besides, toy makers could use the tail as a way of stabilizing the plastic figure to stand. Mister B was fascinated by all types of dinosaurs. It was one of his favorite drawing subjects. Sometimes he’d mix World War II elements in, like U.S. dive bombers attacking dinosaurs, or dinosaurs eating Nazi soldiers. Other times, the drawings pictured dinosaur battles that echoed scenes from movies. His drawings and play were fueled by a steady stream of movies containing dinosaurs throughout the 1950s and early 1960s. Alongside allegorical dinosaur films like Godzilla (1954), there were movies filled with special effects for B-movie viewers. Besides space travel, what down-to-earth subject matter could possibly be more enticing for 1950s filmmakers interested in special effects than dinosaurs? There were many films made, most centered on a lost area of the globe being rediscovered, or formerly extinct animals coming to life. Of note, other than the Dinosaurus! (1960) trailer pictured above, there was King Dinosaur (1955); Lost Continent (1951, with Cesar Romero and Hugh Beaumont, no less); and Two Lost Worlds (1950). Mister B saw them at both drive-in theaters and at home in glorious black and white on the family television. 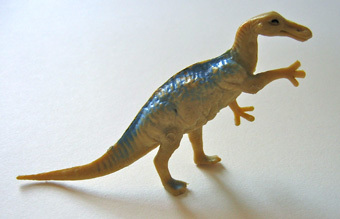 What role did dinosaurs — and plastic dinosaur toys — play in your boomer Wonder years?